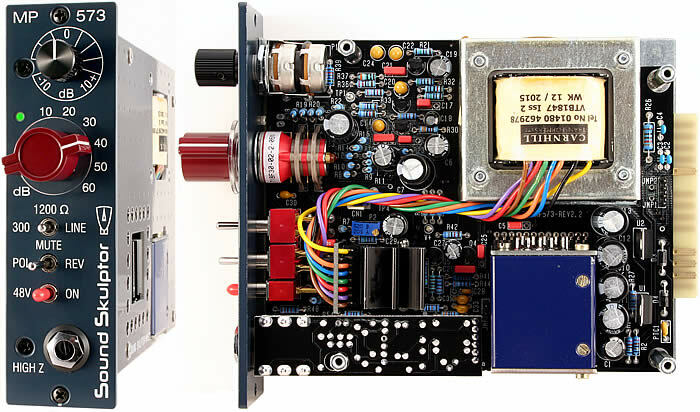 The MP573 is a two stages, single ended class A preamp, based on the design that was originally used in the Neve 1290/1073 modules, that has been adapted to the '500' format of API. The sound of the MP573, like its model is full, silky, detailed and musical, slightly larger than life, very complimentary to a digital recording environment. The MP573 is great on vocals, acoustic instruments and generally all close miked sources that need to be pushed forward in the mix. 3 Gain switch: In combination with the level potentiometer the overall gain can be set between 0 and +70dB. The 10 and 20 positions entirely bypass the input stage. 4 Input impedance: Center is the standard 1200 Ohms input impedance. Left sets a 300 Ohms low impedance, useful for ribbon mics that also adds 6 dB of gain. Right sets a 10 kOhm impedance input pad for line levels. 7 High impedance input (> 1 megohm) for instruments. The instrument signal goes through both transformers. The MP573 kit is an easy build in spite of a rather large number of components. The only setup is adjusting the bias current in the output stage. It requires a standard DC voltmeter. Hello. I just wanted to throw you some feedback (of the good kind). Now that I've had my 573 pre in use for over 1.5 year, I gotta say it's GREAT! I have some other Neve clones and legit API 512c pres and the 573 hangs right with them. In fact, the DI is so huge it's become my go to for Bass guitar. The 573 has also been doing the main vocal tracks on my current project, as well as having some duties recording guitars through Marshall amp. I'm tracking drums for my project in two weeks and plan on using the 573 with a tube mic for "front of kit" duties and I know it will sound HUGE! All said, it is a great kit at a reasonable price. It arrived quickly! And JPK is great at answering the tech questions. I still have a slot left in my lunchbox and am curious about the MP566. But another MP573 is very likely. I can't recommend it enough! For the record, I had never soldered before I bought my first Sound Skulptor kit (CP5176). I love this pre! I use it for everything, but it's especially cool on vocals. It may be taboo, but I even use it on acoustic guitar. The build is easy and straightforward. The sound is great from crisp cleans to colorful harmonic overdrive (I like this on some vocals and bass). The MP573 was the very first DIY preamp I’ve ever built. Even with very little soldering experience building it was a breeze – thanks to the detailed assembly guide. By now, I own five different outboard preamps, but the MP573 is still my favourite for male vocals, acoustic and electric guitars as well as bass. I’ve never had a Neve 1073 in my studio, so I can’t really say how close the MP573 is to the original, but I do know that it is a solid piece of gear with high quality components and an excellent warm and rich sound. One thing I sometimes miss is a trim knob that can attenuate the signal by more than the currently available 10 dB. If I want to drive the input transformer really hot for a fat distorted sound, it’s sometimes difficult to bring down the volume of the preamp to a level that does not distort my audio interface. I found a workaround for that, but having the option in the module would be helpful.